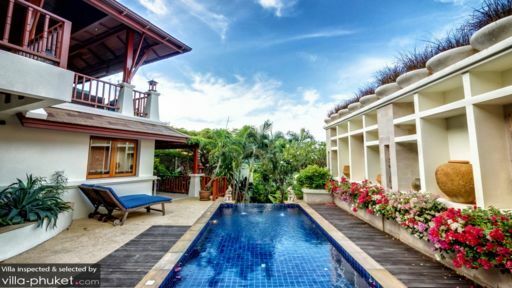 Villa Orchid Hill is your quintessential home away from home offering you a cozy sanctuary where you can spend hours idling away with a good book, lounging in the private pool, resting in the master bedrooms or simply enjoying the gorgeous view. 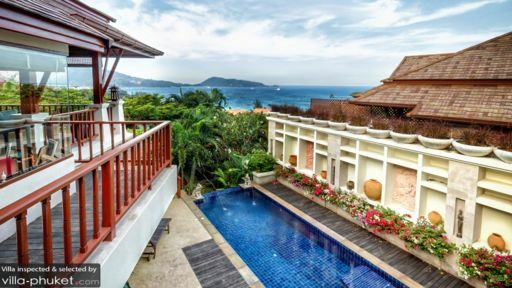 With three bedrooms, out of which two are master suites, there is something for everyone at the villa, as it is part of the L’Orchidée Complex in Patong so you can enjoy the bustling nightlife of Patong beach as well as the many restaurants and sights that make this part of Phuket so attractive! The villa has two lavish master bedrooms and a guest bedroom that are fully-furnished to offer the best in comfort and style to guests. The master bedrooms are furnished with king-sized beds, wooden flooring and sofas for added comfort. The bathrooms for the master suites are fitted with whirlpools for the best of times having a lavish bath! The guest bedroom is furnished with queen-sized bed, a bookshelf lined with bestsellers, and some toys if you are traveling with kids. It also has an en-suite bathroom fitted with amenities. The villa offers spectacular landscaping using abundant nature to its purposes in an eco-friendly and wholesome manner. There is the free-size private swimming pool in the middle of it all, inviting you take a dip in its cool, crisp waters. The walls of the villa are flush with vibrant flowers and climber plants for a creative and colorful exterior that works together with nature’s bounty. There are sun chairs for guests to lounge after a swim, perfect for sunbathing, reading, or a quick nap between laps. 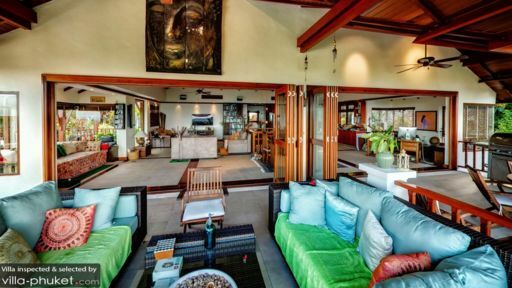 The living area at Villa Orchid Hill is partially outdoors and partially indoors, meaning that you get even more space to hang out with friends and family. Both the areas are furnished with comfortable sofas and ample chairs four everyone to relax on. The colorful décor sets the living areas apart and creates a nice ambiance where you will feel at home. There are several cozy nooks that you can find around the house, corners furnished with bookshelves and comfy couches to lie back on. Striking artwork decorates the walls of the living area adding pops of color to the room. Ascend the steps to reach the dining area and kitchen at Villa Orchid Hill, and this is where you will find outdoor sitting as well out on the terrace overlooking the beach! An eight-seater dining table is placed in the area and there is a massive open-kitchen which is fully-equipped and fitted with modern amenities and appliances. With exposed wooden beams and traditional ceilings, the living and dining area is an amalgamation of both traditional and modern décor! Apart from the shuttle service to the complex entrance, the villa staff is friendly and accommodating towards the needs of guests. The housekeeping and maintenance is well-taken care of and so is your privacy. The chef can prepare some delicious meals for you at extra cost, and if you wish there can be a driver and car arranged for you as well! In-house massages are a real treat and can be yours at minimal cost! Patong is one of the most famous beaches in Phuket, hailed as the best for its nightlife and many attractions. If you are a surfer, then Kalim beach is the right place for you, known as best surfing site. There are several restaurants and beach clubs in the area like Joe’s Downstairs, White Box Bar & Restaurant, Pan Yaah for its Thai cuisine! We have visited Phuket many times over the last 18 years and stayed in many different villas but for sure this was the best. Lots of space, beautiful setting, spectacular views across the bay especially in a storm. Discreet cleaning. Washing machine & dryer which was a first. Would definitely return to this complex. We were a family of six, four children, 8yrs, 15yrs, 19yrs & 20yrs.